There’s no better way to cultivate high end marijuana products, than to have a team of happy people that are passionate about their work. Smokey Point Productions, a marijuana producer/processor from Arlington, WA will be visiting Destination HWY 420 for a Meet & Greet. SPP offers amazing cannabis products for great prices, such as: Flower, Infused Prerolled Joints, Vape Cartridges, Concentrates, and Edibles. Come visit us in East Bremerton to learn more! 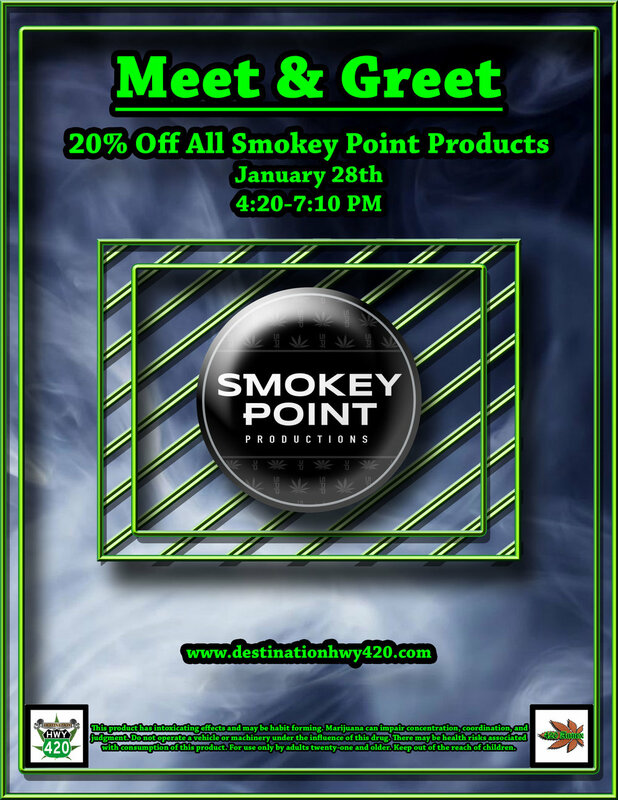 20% Off All Smokey Point Products On 01/28/19! Smokey Point Productions produces some of our favorite infused joints made with high quality buds and potent shatter. These joints pack a serious punch, smoke responsibly! Visit us in East Bremerton to learn more. At no time in history has cannabis been so potent, flavorful, or as smooth as it is today. Smokey Point is “on point” with their top shelf quality infused joints. When you take great buds and mix in some cannabis concentrate, then roll it all into a joint, you’re looking at one of the hardest hitting marijuana products available in the world. Yes, we agree that other forms of cannabis products may contain higher percentages of cannabinoids, like you may find some distillate with 99% THC, but these prerolls may hit you even harder than a dab of distillate. Some people might not agree with my previous statement, but there is logic behind my belief. Marijuana concentrates and extracts are the result of processes that separate some of the chemical compounds from each other. While the technology and methodologies used to create concentrates are becoming extremely efficient, the truth is that these processes are leaving behind some of the chemical compounds that have medicinal, psychoactive, and other synergistic effects. When cannabis is processed into concentrated products, you no longer have the full entourage effect you’d get from whole plant matter. While a 99% THC concentrate may initially hit you really hard, the missing chemical compounds may work to extend the effects, or in some cases increase the amount of cannabinoids that are able to cross the blood-brain barrier. Mixing raw marijuana flower with cannabis concentrates gives you the full expression of all the chemical compounds, full entourage effect, plus higher levels of cannabinoids. Products with flower/concentrate mixes like these infused prerolls from Smokey Point will hit you hard, last long, and taste great. One of the most incredible things about these infused prerolls is their price. These infused joints are normally only $10/joint, but they’ll be 20% off for this Meet & Greet! Smokey Point uses some of the best technology and hardware to produce their vape cartridges. When you have top quality cannabis oil, you’re doing yourself a disservice to put it in anything less than the best vape technology on the market. SPP fills their C-Cell vape cartridges with extremely potent distillate cannabis oil. If you’re near the Kitsap County area, stop by our store to learn more! Do you even vape bro? Come on guys, it’s 2019, if you haven’t tried vaporizing marijuana yet, you’re falling behind the times. Vape cartridges are quickly growing in popularity, as well as in quality. In 2015, it was still difficult to find a good quality cartridge with safe, potent, and flavorful oil. Today, vape cartridge technology has reached incredible levels, and the cannabis oil that fills them is precisely formulated for a variety of qualities such as flavor, viscosity, potency, and effects. Smokey Point vape cartridges are made with the latest and greatest technology, tuned specifically to maximize the quality of your vape hits. Smokey Point uses C-Cell cartridges which make your last hit as good as the first one, without any burnt taste. The oil they fill their cartridges with is a cannabis distillate, which is very clean and potent. Smokey Point produces a variety of indica, sativa, and hybrid vape cartridges that include landrace and exotic cannabis cultivar. One of the best benefits of vaporizing instead of combusting plant matter, is that it releases significantly less carcinogens, and is much easier on the lungs. Another great benefit of vape pens is the ease of use; grinding bud, filling bowls, and cleaning glass can be messy and inconvenient when you’re in the middle of playing a video game, or doing something else that demands your attention. With vape cartridges, after you attach the unit to a battery, you’ll be set for as many hits as a cartridge will last you. While I personally love the smell of cannabis, many people don’t, so with vaporizing, you can also negate the issue of that skunky bud stinking up your house. If you’re interested in vaporizing cannabis oil, this meet & greet is a great time for you to get some more information, and pick up a vape cartridge for discounted prices. Smokey Point Productions produces extremely potent, flavorful, and smooth cannabis concentrates. Their concentrates come in a variety of forms such as crumble, shatter, and sugar wax. SPP concentrates are made from high end buds from strains such as Cinderella’s Dream, Illumidodi, and Plushberry. To learn more about Smokey Point concentrates, visit our store in Kitsap County, WA. Smokey Point produces some of the most sought after forms of concentrate: crumble, shatter, and sugar wax. Sugar Wax- Goopy, slightly liquidy consistency with shinny crystals throughout the mixture. Sugar wax is known for having fully expressed flavor profiles, and for potent effects. PROMINENT TERPENES: Myrcene, Caryophyllene, a-Pinene, Limonene. PROMINENT TERPENES: Myrcene, Limonene, a-Pinene. PROMINENT TERPENES: a-Pinene, Myrcene, Caryophyllene, B-Pinene. Those are just a few of the amazing cannabis strains coming out of Smokey Point Productions. To find out what else they have to offer, visit their website, or stop by our store in East Bremerton and meet the team on 01/28/19 from 4:20-7:10 pm. Destination HWY 420 is one of Bremerton’s favorite recreational and medical marijuana retailers. Recently certified as a “Clean Green” business, large selection of “Clean Green Certified” marijuana growers, producers, and processors. High THC and high CBD products available. Huge variety of concentrates such as BHO, EHO, PHO, CO2, Distillate, Rosin, Live Resin, Crystalline, Honeycomb, Shatter, Terp Sugar, and more. Lots of custom glass bongs, pipes, dab rigs, nectar collectors, vape pens, electronic dabbers, and more. Now offering online ordering for in-store pick up. Servicing the Bremerton, Manette, Gorst, Silverdale, Port Orchard, Poulsbo, Seattle, Bainbridge Island, Gig Harbor, Tacoma, and other near-by Kitsap County areas.